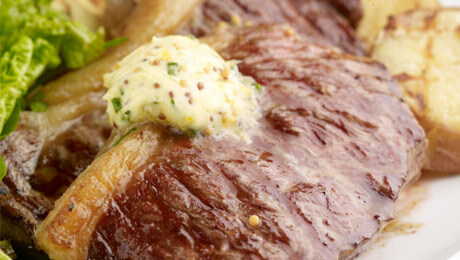 The perfect steak supper for those evening gatherings with family and friends. Cook the potatoes in a saucepan of boiling water for 8 minutes or until just tender. Allow to cool slightly then slice into 1cm slices then place in a bowl and toss in some olive oil. Brush the steaks with a little oil then season with some salt and pepper. Place on the barbecue and cook for 4 minutes on each side for medium or longer if required. Remove from the barbecue and cover with foil, allow to rest for 5 minutes. In the meantime cook the potato slices on the barbecue for 2 minutes on each side. Place the butter, chives, mustard, garlic and lemon zest into a small bowl and stir until well combined. Add a dollop of the mustard butter to each steak once plated, then add the potato slices and some mixed greens, serve immediately.